Our Vertical Sign Holders Come in a Variety of styles and sizes. Known as bottom loading sign holders, T style sign holders, and top loading sign holders our sign holders are produced from clear acrylic in the USA at industry low pricing. 4" wide clear acrylic clip for signs. Our competitors sell this same unit for $1.38!!!! This 4" wide clear acrylic sign clip holds single sheets of paper or brochures if needed. Call for PRICING DISCOUNTS on 50+ units No Handling Fee for Small Orders. BEST SELLER!!!! Call or e-mail for pricing on 100+ units! No Handling Fee for Small Orders. Logo Printing available, see SILKSCREEN Page, Call us for Volume Pricing & Custom Sizes! Holds a 5" wide x 7" high sign Call or e-mail for pricing on 100+ units! No Handling Fee for Small Orders. Logo Printing available, see SILKSCREEN Page, Call us for Volume Pricing & Custom Sizes! Holds a 5 1/2" wide x 8 1/2" high sign Call or e-mail for pricing on 100+ units! No Handling Fee for Small Orders. Logo Printing available, see SILKSCREEN Page, Call us for Volume Pricing & Custom Sizes! Holds a 7" wide x 5" high sign Call or e-mail for pricing on 50+ units! No Handling Fee for Small Orders. Logo Printing available, see SILKSCREEN Page, Call us for Volume Pricing & Custom Sizes! MOST POPULAR ITEM Made from Clear Acrylic, not blue tint imported plastic! Call or e-mail for pricing on 50+ units! No Handling Fee for Small Orders. Logo Printing available, see SILKSCREEN Page, Call us for Volume Pricing & Custom Sizes! Holds a 11" wide x 8 1/2" high sign Call or e-mail for pricing on 100+ units! No Handling Fee for Small Orders. Logo Printing available, see SILKSCREEN Page, Call us for Volume Pricing & Custom Sizes! Holds a 11" wide x 7" high sign Call for pricing on 50+ units! No Handling Fee for Small Orders. Logo Printing available, see SILKSCREEN Page, Call for Volume Pricing & Custom Sizes! Made in the USA, not a cheap import. This unit holds a 11" wide x 17" high graphic Call for pricing on 50+ units! No Handling Fee for Small Orders. Logo Printing available, see SILKSCREEN Page, Call for Volume Pricing & Custom Sizes! Holds a 5 1/2" wide x 3 1/2" high sign Call for pricing on 50+ units! No Handling Fee for Small Orders. Logo Printing available, see SILKSCREEN Page, Call for Volume Pricing & Custom Sizes! Holds a 5 1/2" wide x 7" high sign Call for pricing on 50+ units! No Handling Fee for Small Orders. Logo Printing available, see SILKSCREEN Page, Call for Volume Pricing & Custom Sizes! Holds a 7" wide x 5 1/2" high sign Call for pricing on 50+ units! No Handling Fee for Small Orders. Logo Printing available, see SILKSCREEN Page, Call for Volume Pricing & Custom Sizes! Holds a 7" wide x 11" high sign Call for pricing on 50+ units! No Handling Fee for Small Orders. Logo Printing available, see SILKSCREEN Page, Call for Volume Pricing & Custom Sizes! Holds a 3 1/2" wide x 5 1/2" high sign Call for pricing on 50+ units! No Handling Fee for Small Orders. Logo Printing available, see SILKSCREEN Page, Call for Volume Pricing & Custom Sizes! BEST SELLER, Restaurant Favorite! Call for pricing on 50+ units! No Handling Fee for Small Orders. Logo Printing available, see SILKSCREEN Page, Call for Volume Pricing & Custom Sizes! BEST SELLER!!! Call for pricing on 50+ units! No Handling Fee for Small Orders. Logo Printing available, see SILKSCREEN Page, Call for Volume Pricing & Custom Sizes! Please see our Silkscreen Page for PRICING & Details! We can add your Logo to any of our displays!!! See instructions on the Silkscreen page (Go to Home page and click on the SILKSCREEN link.) All pricing is also on Silkscreen Page! "T" Style Plexi Frames and Sign Holders- These "T" style plexi frames are a great addition to any business. 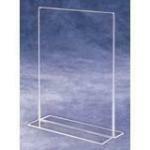 We offer these plexi frames in a variety of sizes to meet your particular needs. The plexi frames, called acrylic photo frames, are conventionally used in dining institutions or checkout counters. These acrylic photo frames are referred to as T-style because the frame and base meet to form a "T". Simply insert your transcribed graphic from the bottom or the sides. This allows for quick and simple changes to your acrylic photo frames. The plexi frames can hold either a horizontal or vertical graphic, depending on the style you choose. You are able to insert these graphics back-to-back for double sided viewing. Some of these sign holders have a single pocket literature attachment. This allows you to disperse promotional material while advertising. You may choose these acrylic photo frames with either a frosted or polished edge, depending on your preferences. The plexi frames with polished edges have more of an upscale look. These displays are great acrylic frames for any location and can be used as a countertop or hotel display. In addition to the products offered on this page we offer a broader selection of sign holders and graphic holders. You are guaranteed to find the ideal display for you. Contact our sales department to add your logo, company, or product name to make a truly unique design.